We take care of securely storing device tokens and all communication with Google's Cloud Messaging or Apple's APN servers. Interstitials and dialogs are often used for limited offers and together with notifications. Display one after the app starts, schedule them or use any event trigger. Remotely configure your app without resubmitting it to Google Play or the App Store. Conduct A/B tests or control any behaviour from the air. Include screens of article pages (like "Terms & Conditions" or "Recent updates"), or lists of blog posts or other news. All editable with the CMS and cached in the app. Add Appwoodoo to your app via Gradle or Cocoapods, and integrate the take-off calls. Yup, it's that simple. If you need help, just contact us anytime. Other SDKs might steal user data or cause crashes. We don't do any of those; check out our open-source Android/iOS SDKs on Github! How many apps can I add to one account? All of them! All our packages, including hobby and business ones, do allow you to add multiple apps. The package limits are set accross all apps in your portfolio, so you can spread your Woodoo costs, and let the popular apps pay for the less popular ones. What happens if my app becomes an overnight hit? Can I use my own CMS? 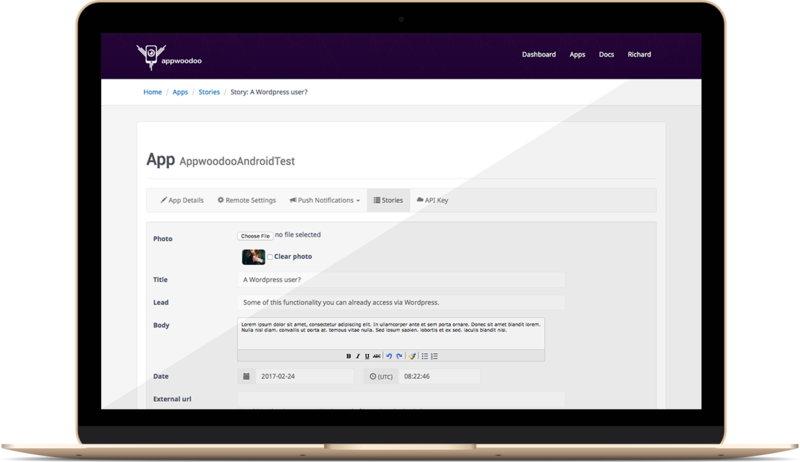 Yes, you can: Appwoodoo comes with a set of public APIs that you can use to integrate app features with your backend, for example, sending push notifications directly from your own admin interface.